Our cosmic backyard as seen from 30 light-years away. 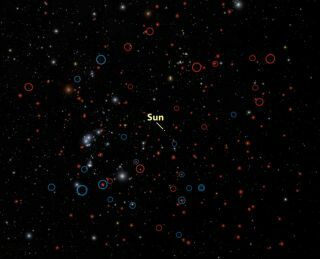 Red circles indicate the discoveries of brown dwarfs by NASA's WISE space telescope. Brown dwarfs are small, cool and hard to spot, but until recently we believed there were as many of these "failed stars" as bona fide stars in the galaxy. However, observations by NASA's Wide-field Infrared Survey Explorer (WISE) have revealed a surprise — there are actually fewer brown dwarfs in our cosmic backyard than previously believed, despite indications to the contrary. ANALYSIS: Do 'Ultracool' Brown Dwarfs Surround Us? There was some excitement when WISE started turning up evidence for the coolest of these mysterious objects. Perhaps hoards of these sub-stellar dwarfs are lurking in the space between the stars? Could their detection lead to the discovery that there are actually brown dwarfs closer our sun than the nearest star, Proxima Centauri? Perhaps these brown dwarfs could become interstellar stepping stones, providing "rest stops" for future interstellar explorers! Sadly, the excitement may have been premature. Initial WISE results estimated that the Milky Way must have approximately equal numbers of stars to brown dwarfs. Sadly, as WISE is showing from the vast amount of data it has collected through surveys of the galactic neighborhood, this estimate may be wildly optimistic. Rather than one star for every brown dwarf, there may be as many as six stars for every brown dwarf. If the runts of the proverbial stellar litter were feeling left out, this news is bound to make them depressed and lonely. One of the awesome things about WISE's ultra sensitive infrared eye was that it was able to pick out the very faint glow from these failed stars. Most interestingly, a sub-class of brown dwarfs — called Y dwarfs — were pure theory before WISE spotted them. In August 2011, an 80 degree Fahrenheit (25 degree Celsius) object called WISE 1828+2650 was uncovered. It is the coolest brown dwarf discovered to date and its existence spawned the idea that many more "ultracool" elusive Y dwarfs are out there. But after further sifting of the WISE data — including data for the entire infrared sky by the end of its primary mission in 2010 — it appears there are less of these cool objects than thought. In fact, the local volume of space in our part of the galaxy appears to have a sparse brown dwarf population. Since the discovery of WISE 1828+2650, the space telescope has recorded 200 brown dwarfs, including 13 Y dwarfs. But to understand the density of the brown dwarf population, an astronomical technique called parallax was needed to estimate their distances from Earth. After this exercise, the WISE team found that 33 brown dwarfs can be found within 26 light-years of sun. In the same volume, 211 bona fide stars live. There are therefore roughly six stars for every dwarf. "Having fewer brown dwarfs than expected in our celestial backyard just means that each new one we discover plays a critical role in our overall understanding of these cold objects," said Chris Gelino, a co-author of the research that has been accepted for publication in the July 10 issue of The Astrophysical Journal. "These brown dwarfs are fascinating objects that are bridging the gap between the coldest stars and Jupiter." They may not have the gravitational heft of their stellar cousins to fuse hydrogen in their cores, but the mysteries behind these failed stars continue to shine bright.